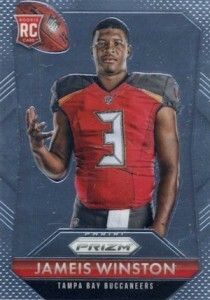 Seemingly a bit easier to distinguish compared to last year, the 2015 Panini Prizm Football Variations opt for casual posed photos that stand out versus the more-standard "action" shots found on the base rookie cards. 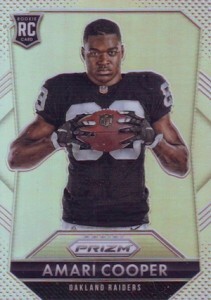 Ten key names from the 2015 rookie class are included, with Amari Cooper, Todd Gurley, Marcus Mariota and Jameis Winston being the top options. 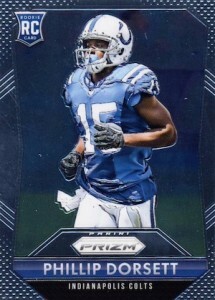 Panini's take on chromium, 2015 Panini Prizm Football has carved out a spot with collectors and will likely be even bigger in 2016 as the only Chrome-like option when Topps is removed from the NFL card equation. 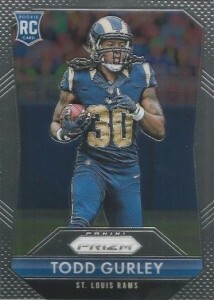 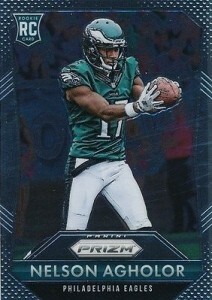 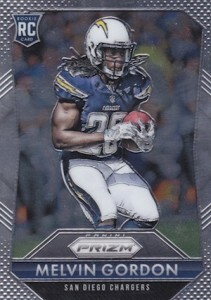 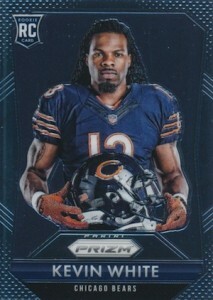 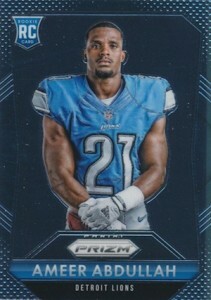 This is not the first Prizm Football product of the year as 2015 Collegiate Draft Picks came out early this season. 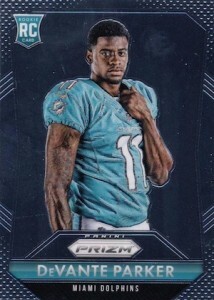 While the two Prizm sets feature many of the same players, the difference is clear because the Draft Picks product only includes college images. 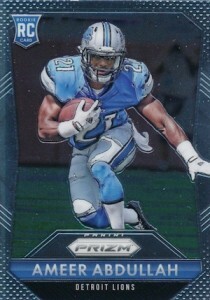 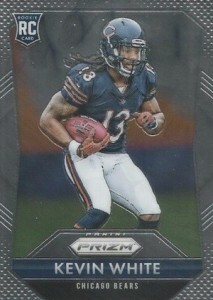 Unlike some of the other variations in the hobby, the only difference in Prizm is the image on the cards. 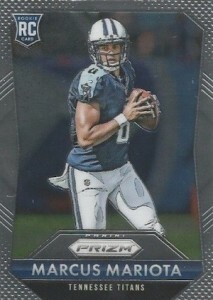 However, one noticeable thing is that while the base cards are treated to 14 parallels, variations are covered in a more limited fashion, with just four parallels - Prizm, Gold Prizm (#/10), Gold Vinyl Prizm (#/5), and Black Pulsar (1/1). 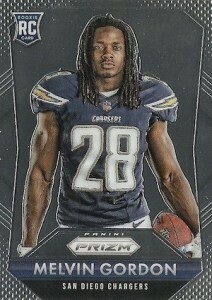 Collectors may also spot that the backgrounds are completely blank in the variation cards. 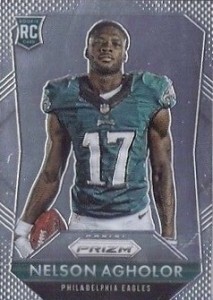 While most of the variations stick with the action base and posed variation, Phillip Dorset is the one exception as his variation and base card only feature a subtle difference in body position. 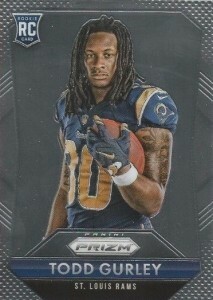 Both cards also include the background image. 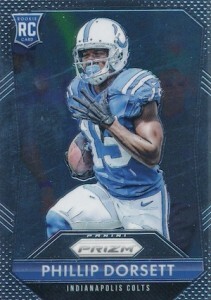 The full list of Prizm Football Variations can be seen below with side-by-side comparisons to their base rookie card versions. 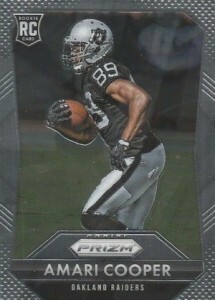 There is also no word on the individual rarity of the variations. 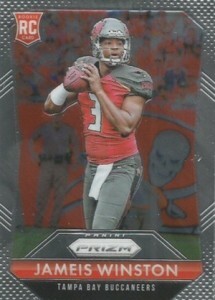 Click on the images or listings to shop for cards on eBay. 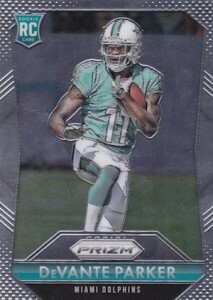 Prizm parallels are shown for some of the variation cards, but the image is the same. 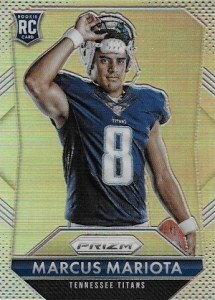 Marcus Mariota Gold Prizm Rc 6 10 Photo Variation Ssp 2015 Prizm BGS 9.5 1 1?